For the past 12 years of doing home inspections and engineering planning projects throughout Florida I have spent a great majority of that time either driving “to and from” job sites or just plain ole “stuck in traffic.” I can easily say it’s been the most frustrating part of my job. I easily have put over 70,000 miles on my vehicles in any given year over the last 12 years of trying to provide service to over 25 Florida counties. Granted many of the projects I undertook I did in conjunction with local Home Inspectors and Engineers from the city where the project was, but I still found myself having to do a lot of driving… a lot of driving. This past year I decided to take up flying. At the time I decided to do it, it was going to be a hobby, an attempt to fulfill a childhood dream of learning to pilot a plane. 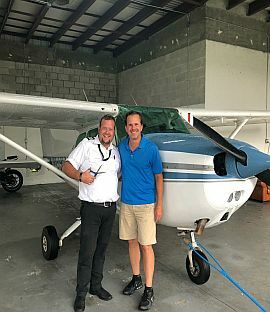 I started taking flying lessons 1 to 2 times per week and I quickly got hooked. Other pilots had told me that it would happen. They said that once I got my taste of flying that would be all I would want to do. I must say they were right! I read all the books and took all the ground training necessary and I am happy to announce that I have become a Licensed Private Pilot. I am continuing my flight training and I am now learning to become IFR Instrument Flight Rated pilot and my plan is to become a commercial pilot, heck I might even become a CFI (Certified Flight Instructor). Do you know what the greatest part of becoming a pilot is for me? You guessed it… I FLY!!! Now, instead of driving hundreds of miles up and down the state of Florida, spending the entire day in the car I am able to be more productive and see more clients. Last week, I met a developer in Marathon Key, Florida for a mid morning inspection and a home buyer in Clewiston, Florida in the afternoon. I tell you it does not get any better!